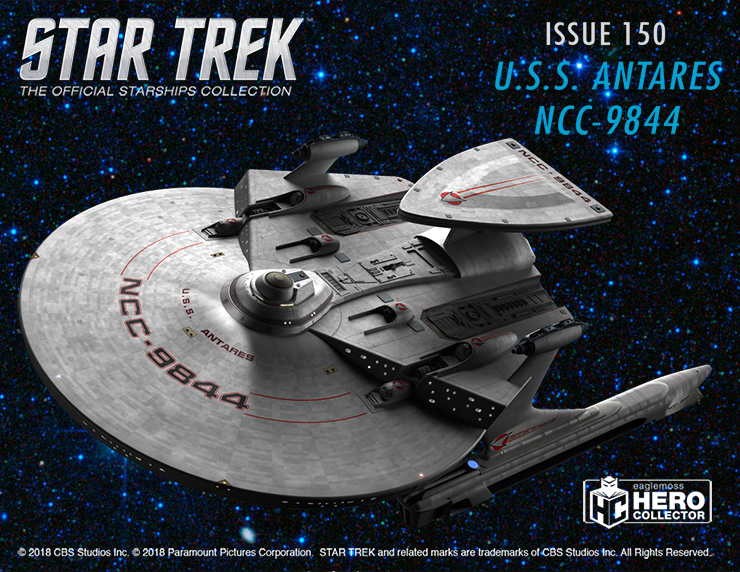 Anyone know if Eaglemoss is planning to do any discovery ships in scale with the standard Star Trek release? The Antares and a bunch of other ships are out, some of them fortunate some of them deeply unfortunate. Others include the Krenim warship, Dominion warship, Baran's Raider (aka Miradorn Vessel Micro Machine), Fesarius, some part of V'Ger, and Nightingale. (I thought the Yeager was a lazy and deranged kitbash, but dang). The Antares is pretty sweet though -- this is very deep into obscure ships. Like, who'd have thunk? The upper pod on the studio model seemed larger though, I have to say. And taller. Dominion warship and Vger are my pics. Is the Discovery line actually going to be finished? Anybody else thinking the same thing? I'm just glad they won't make the more hideous Klingon designs like the Daspu" or Bsthl or whatever it is called and go for ships that people actually want instead. Also, with the Second season starting this week, there might be more potential ships in the Discovery line down the road. Bonaventure's are en-route, mines waiting for me at home according to DPD. Delayed response to getting the Disco-prise, mine arrived last week and I have to say its absolutely wonderful. As I've said before, I'm not a big fan of the show particularly, but this redesign really really works for me. Mine has straight nacelles and came un-damaged unlike quite a few peoples. I'll be getting the Clarke I think and maybe the Buran as its such a striking design. The coloring on the Qoj is incredible. Incredible....? As in...random paint splatter? My tardigrade has arrived. While I did not like this strange plot gimmick or the notion that a transdimensional space dwelling creature would resemble an organic planetary lifeform magnified exponentially in size (and including opposable forelimb thumbs no less!)... it is fun to have a Star Trek "toy" or "collectible" (or whatever we call these) of a strange creature, since that doesn't really happen that often for us Trek-over-Wars fans. With taxes, came my specials and bonuses buying. I love the Enterprise F, Bonaventure, Disco-Prise and Spacedock. I like Vger (Love because its the first Vger; execution could have been a little better, like the front end, detailing, etc). Im indifferent to the JJ-Klingong Cruiser and K-Maru. Shuttle set 4 was fun to have, but wished there were more from the prime universe. Im excited about the STO Enterprise F but Im really disappointed about the Discovery. For a CG-based model... its lacking alot of detail which is something the Disco-Prise and other Fed ships in Discovery collection arent lacking. Anyone else realize that were in the mid-40s and only up to 150 has been announced? I have loved the past six years, but im starting to suffer from collection fatigue and space-for-models fatigue. Wont stop me from buying but damn. It was supposed to be 70 and my wife gives me the look everytime i tell her its been expanded. Hope the next 5-10 regular models get announced soon. Plus if theyre going to expand again so i can talk my wife into letting this continue another year or so. Forums been looking dead lately, so hope the fire is still with everyone else. LLAP. Get rid of your wife, then you'll have more room. Nah. She still is good with it. Shes the one who helped me design and build my shelves for the collection. If nothing else they supposedly confirmed they'd be doing the new Picard series ships so you had better start rehearsing that part before you tell your wife! Any official word on why the Cardassian Keldon class hasn’t been in the US store yet? Nothing. Or how preorders of the Federation style Enterprise F were out of stock so quickly. Theyre selling on ebay at 100 bucks or more right now. Petty jackasses buying out inventory and marking it up. ISS Shenzhou has arrived...no magazine for it though. No magazines for Disco specials?? The ISS isnt a special, its a subscriber gift. The AGT Enterprise D didnt come with one either. Hmm...well glad one of us is paying attention! Sure would be nice if any day now I could order the two F's and the Bonaventure. I see they have the mirror AGT-D up for preorder, maybe I should jump on that before it meets the same fate. Does anybody know if the "E-MAIL ME WHEN AVAILABLE" actually works? I tried that a month or two ago and have been wondering if it works or not.